Berta Caceres Human Rights in Honduras Act Reintroduced in 115th Congress! 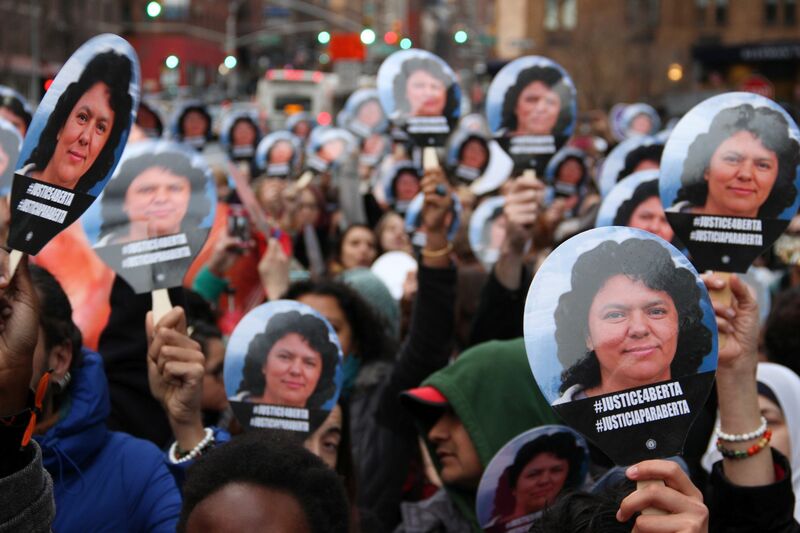 Home Blog Posts Berta Caceres Human Rights in Honduras Act Reintroduced in 115th Congress! Rep. Hank Johnson reintroduced the Berta Caceres Human Rights in Honduras Act in the 115th Congress as House Resolution 1299 (HR 1299) on March 2, the first anniversary of the slain indigenous rights, feminist, and environomental activist. The bill would suspend all U.S. military and police aid to Honduras, including equipment and training, until basic human rights conditions are met. The Honduran police and military have been implicated in hundreds of human rights violations since the 2009 overthrow of the government, and we should not be supporting them with our tax dollars. Berta’s family supports this bill, and we in CRLN believe in supporting the survivors of human rights abuses. Two of the suspects arrested in connection with Berta’s murder worked in military intelligence and were trained at the U.S. Army School of the Americas, and Berta’s family believes the intellectual authors of the crime occupy positions at the highest levels of government. Withdrawing financial support, along with communicating the reasons for doing so, would be a blow to these forces and might weaken their position within Honduras. The social movements in Honduras (LGBT, women, Indigenous, Garifuna, labor unions, environmentalists, small farmers), and the journalists who cover them, are under constant threat of violence, and we in CRLN want to do everything in our power to send the message that they have international solidarity in these dangerous times. There have been credible allegations by an army defector of the existence of death squads within the Honduran military who have received U.S. training and who have a hit list of prominent social movement leaders. We need to stop U.S. training that results in assassinations. The current President, Juan Orlando Hernandez, and his administration and political party are riddled with corruption. He has been named by a drug trafficker leader on trial in New York as receiving bribes from his cartel, with Hernandez’ brother acting as liaison. His National Party stole hundreds of millions of dollars from the national health insurance system to fund his first campaign. He will run again for President this fall, which violates the Constitution; and he fired four Supreme Court justices who objected and appointed four who were in favor of his re-election bid in order to be able to run again. The U.S. should not reward with funds someone who seems willing to benefit himself at the expense of his country. Call Your Illinois Rep to Lift the Blockade!